One of the rich heritage comes in form of the greatest footballing country in the world - Brazil. Did you know that the national delicacy in Brazil comes from Portugal? Read through this post and you will discover the amazing Portuguese cuisines that nurture the world's greatest footballers. Call me crazy for associating food with football talent, but I have looked elsewhere and nothing makes more sense than this. Of romance and literature, Shakespeare and Sir Charles Dickens take the top spot. Of music and its composition, Mozart and Beethoven are unrivaled. Of exploration; two guys come to mind. One was Italian and the other a Portuguese. They were Christopher Columbus and Vasco Dagama. One would discover the Americas and the other the East African coast and the Indian subcontinent. Why do I bring this narrative? Because it would showcase the Portuguese as foremost an exploring people and later a source of rich heritage around the world. Check out the list of Portuguese delicacies below. This dish is the Brazilian national dish although it has its roots in Portugal. It is also widely eaten in Macau, Angola, Mozambique and Goa. The dish is made with fresh pork or beef, black kidney beans, and vegetables such as tomatoes, carrots, and cabbage. It is served with rice and assorted sausages such as chouriço, morcela (blood sausage), and farinheira. This is a traditional Portuguese seafood delicacy that gets its name from the pan on which it is cooked. 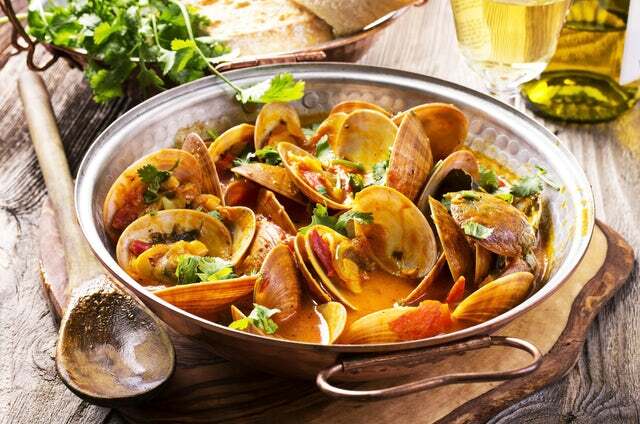 It is made with a combination of clams, sausage, ham, onion, chili, and tomatoes with spices such as garlic. It is a very healthy dish whose delicious taste will take your taste buds to a new high. If you like spicy food, then you has just found the right dish. Spicy chili is put in the cooking oil that is used to barbecue the chicken; and to take the heat even higher, the sauce that is used to marinate the chicken is also peppered. It is served with home cooked fries and salads. This is a salt dried cod dish that will take you back to the exploration centuries when the sailors would preserve their cods with salt. The Portuguese have so many ways of cooking the delicacy that you can have a different version every day for the entirety of your stay in Portugal. This is a roasted suckling pig that is roasted and seasoned over a fire for a long time so that the flavor of the pork is brought out. The delicacy is popular in events such as weddings, fairs exhibitions etc. Portugal is a country of many arts, one of them being their culinary genius. If not for history, visit the country for its culinary delights.